Here is another opportunity. A creative one on how to use your new half wall space. 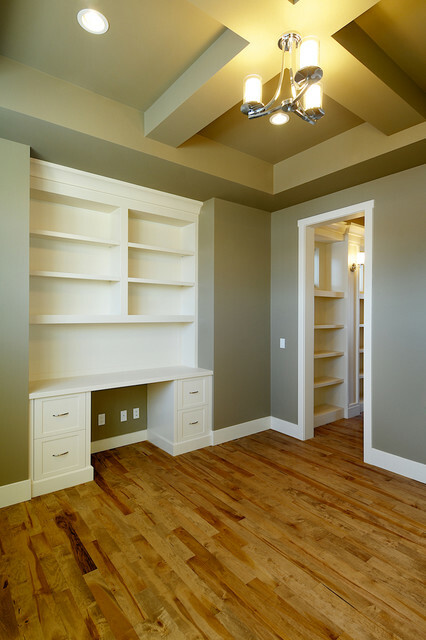 You should in addition to your cabinets, consider a foldout desk, table. Either coming down from one side, say 18" wide. than can be brought down, (from right) in your photo, or when needed to increase space, hinged from below. There are many options! Here are two ways with resources on how to build a foldout desk table, and hinge resources. How to build a foldout desk, table. Piano Hinge folding desk, table. hinges resource. What is the wall color used? They are a 3" wide rustic maple finished on site with a custom stain. The comment above is correct. Most desk areas that are on top of base cabinets are 24" deep, and the shelving is probably set back 6" from that - so 18" deep shelving. These look custom to the niche of the wall space, so you could certainly alter this in your home, and make them deeper or shallower. The base cabinets were built at 24" deep and I had the top portion built at 12" deep. HTH! trim color - what is the trim color called? We built this home about 6 years ago, I no longer have that information. How much would something like this cost to have done? I can NOT do. I am not sure, custom cabinetry is priced out differently all over the country. I would suggest you contact a local cabinet maker for a quote. Spacing of shelving from top of desk? - What is the spacing between desk top and bottom of first shelf? Spacing of shelves? How high is ceiling? I'm not sure, we no longer have the mill-work drawings for this home, I am going to guess 18"
This home was constructed 3 years ago, I no longer have the lighting information for this one. Where did you get the base cabinets for the desk? Are they file drawers?